Recently I had to assess and tune quite a lot of SQL Server instances and one the things that are often overlooked is the location of the system databases. I often see instance where the system databases are located in the system drives under the SQL Server default installation path, which is bad for many reasons, especially for tempdb. I had to move the system databases so many times that I ended up coding a script to automate the process. The script finds all system databases that are not sitting in the default data and log paths and issues the ALTER DATABASE statements needed to move the files to the default paths. You may also point out that moving all system databases to the default data and log paths is not always a good idea. And you would be right: for instance, if possible, the tempdb database should be working on a fast dedicated disk. However, very often I find myself dealing with low-end servers where separate data and log disks are a luxury, not to mention a dedicated tempdb disk. If you are concerned about moving tempd to the default data and log paths, you can modify the script accordingly. After running this script, you can shut down the SQL Server service and move the data and log files to the appropriate locations. 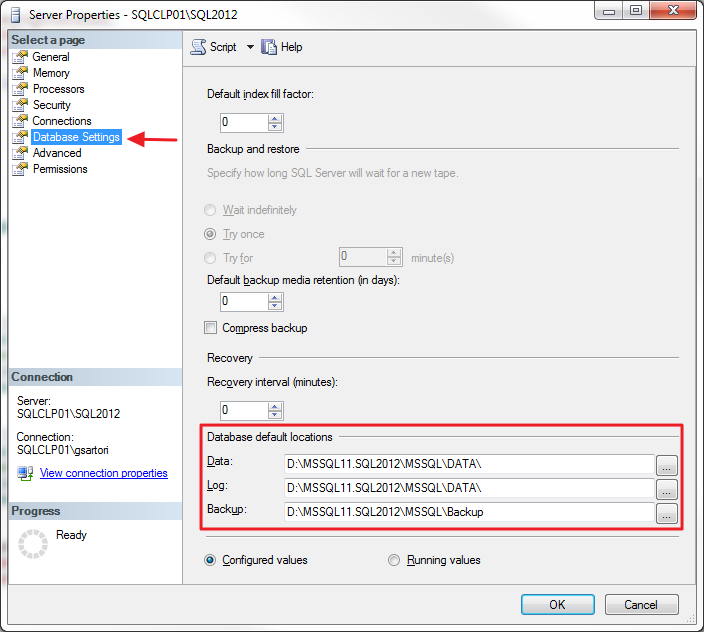 When the files are ready, you can bring SQL Server back online. BE CAREFUL! Before running this script against a clustered instance, check what the xp_instance_regread commands return: I have seen cases with SQL Server not reading from the appropriate keys. Posted on March 22, 2013, in SQL Server, T-SQL and tagged Maintenance, setup, SQL, SQL Server, SQLServer, T-SQL. Bookmark the permalink. 2 Comments. Great post Gianluca! Storage prices nowdays are so low that not having tempdb on a separate disk will be more expensive than buying the extra storage. Of course is not always easy to convince management of that, but it is worth trying. Thanks for commenting! Your consideration about storage prices is true, but often it’s not just a matter of hardware costs. SAN administration is a cost, SAN disks often cost a LOT more than DAS disks and (one thing I have learnt recently) even weight can be something to keep in mind when the servers have to be moved frequently (shipping prices are based on the weight of the goods).